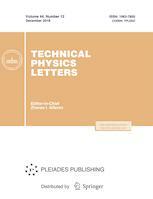 Technical Physics Letters is a companion journal to Technical Physics and offers rapid publication of developments in theoretical and experimental physics with potential technological applications. Recent emphasis has included many papers on gas lasers and on lasing in semiconductors, as well as many reports on high Tc superconductivity. The excellent coverage of plasma physics seen in the parent journal, Technical Physics, is also present here with quick communication of developments in theoretical and experimental work in all fields with probable technical applications. Topics covered are basic and applied physics; plasma physics; solid state physics; physical electronics; accelerators; microwave electron devices; holography. Technical Physics Letters is a peer reviewed journal. We use a single blind peer review format. Our team of reviewers includes over 580 reviewers, both internal and external (95%), from 9 countries. The average period from submission to first decision in 2017 was 7 days, and that from first decision to acceptance was 21 days. The rejection rate for submitted manuscripts in 2017 was 32%. The final decision on the acceptance of an article for publication is made by the Editorial Board.